Is my Optimized Success Plan a Scam? This is What’s Really Happening. Name: My Optimized Success Plan. Price: $97. But that’s just the tip of the iceberg. 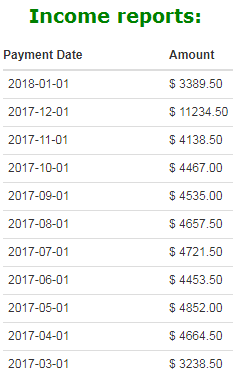 If you keep going further, you will be led into a program where you can end up spending well over $10,000. But you don’t really understand this until you get involved with the original program, which in hindsight isn’t the real program after everything is said and done. It’s just a promoter of MOBE in the end and you already know why it’s doing this. I honestly don’t know who created MOSP, because the info is often vague, there are re-used sales pages and there’s too much focus on marketing get rich quick schemes, but whoever it is, doesn’t negate the fact that getting involved with all this may end up costing you more than you know (and now you do). On March 11th, I reviewed a program called “Cash With Matt”. Like MOSP, Cash With Matt carried me over into MOBE and before it happened, I went through pretty much the same type of sales page and “discount offer”, where if I purchased the program, I’d be discounted $500. As I said in my review of Cash With Matt, this is a deceptive claim because the offer is literally a made up figure used to market the system (if people think they’re saving $500, they’re more likely to buy). I am passing this information onto you, so you know now and in the future, what these things look like and know if they’re real or fake. In this case, it’s fake. I’ve ran into and fallen for this type of scam numerous times. Don’t fall for it too. There’s at least 3 or 4 times that I’ve purchased a look alike program such as My Optimized Success Plan thinking it may have been a unique opportunity to review and every time, they have sent me back into MOBE, a program I have tried to avoid for years because I absolutely dislike their pricing for their education. 1) I have been inside the MOBE program, though briefly, enough to know what you’re getting and I have to say, there’s better educational programs in my opinion. 2) Scams like MOSP have been popping up relentlessly as of late as a way of duping unsuspecting people seeking to make money online and promoting MOBE. What you think starts at $97, turns into a whole lot more if you keep going further. 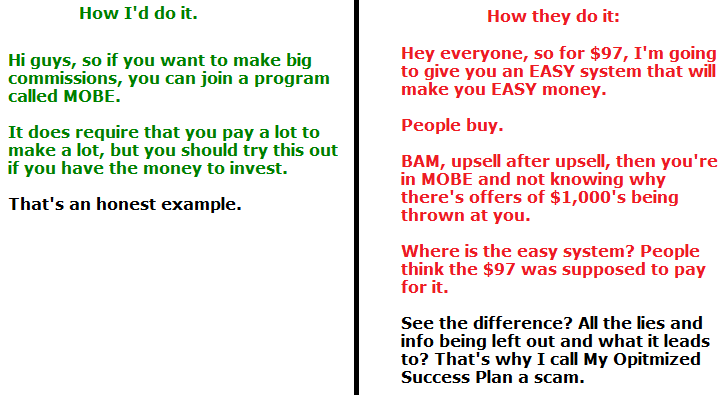 What I consider a scam is My Optimized Success Plan and ANY program that promotes stuff in the way it does (MOBE is not part of this whole thing, just the programs that promote it in such ways), because they are tricking people into thinking the operation is simple and that they’ll make money fast and easy. That’s just a total lie. They don’t talk about the REAL prices, the potential of what people will have to spend and they don’t mention MOBE until you’re already in. It’s just a series of tricks and deceptions that ultimately make me label MOSP a scam. Promote a program honestly, let people know what’s going on and if they did that, I wouldn’t mind giving it a higher rating, but there’s just so many lies and deception, all to promote a program to make big money, that it doesn’t make it worth it at all in my opinion. And the funny thing is, in the 3-4 times I’ve gotten involved with this, I already knew better, but I had to prove it to then warn people about it through reviews like this. The latter example leads down a path of lies and deception and it also makes people getting involved think they have to do the same. This is NOT the way it should be. It’s not in my opinion an honest way to make money. BE UPFRONT with people. Final Rating: My Optimized Success Plan. 0 out of 10 stars. Lack of transparency and honesty in this program is what ultimately dooms it to the lowest rating I can give, and it earned it. Now in the above example of how to legitimately promote something, you may think I’ll promote MOBE to you, but you’d be wrong. I don’t think (actually I know) people don’t need to spend so much money trying to make money. I have always been a proponent of learning to make money online in the cheapest way possible (affiliate marketing is one way), to have an idea of how the business works, and then to make your own, EDUCATED decision, but after you see how everything works and know what you’re buying and how much it’ll cost. 1) Is completely inexpensive to get started with (free actually). 2) There’s no back door, high ticket upsells at the end of it (unlike other programs, hint, hint). 3) The education is arguably (in my opinion) FAR more comprehensive and open ended than you could ever get in MOBE. 4) You can also make good, even GREAT money following it. In conclusion, I am not completely against tying out expensive programs, but only if you know what you’re going to get. With the way MOBE is often promoted (at least how I’ve seen it promoted), people aren’t told that. Plus, are you truly ready to spend a lot of money? Whether or not the answer is yes, the program I recommend to you is in my opinion going to be a FAR better alternative for a plethora of reasons as you’ll see.